After studying Psychology at University, Renu spent most of her early career working in a supportive role, working first in a school with children with disabilities and then later with adults in the community. “These roles involved a lot of one on one time and small group work which I really loved”, says Renu. In 2008, Renu moved away from support work, wanting to try something new. She started a fashion blog and began creative writing for magazines. Her blog opened up opportunities within the field of digital marketing, which at the time was completely new to Renu. 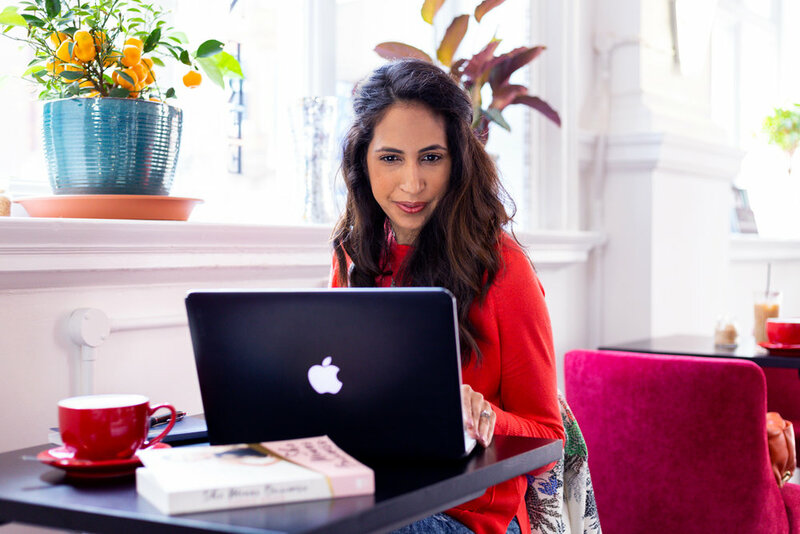 Realising her passion for digital marketing, she went on to work for luxury brands including Monica Vinader and LINLEY, managing digital marketing and ecommerce, as well as writing blog posts and running events. “I relocated to Leicester after getting married, and whilst the plan was to work for myself all along, it was a shock to the system; Leicester is much more relaxed than London and so I decided to get a job and see where it would take me.” Working for a smaller company allowed Renu to see the impact she was having to their digital marketing, and fed up with the 9-5 life, she took the leap and started her own business coaching others in digital marketing and social media. Renu took some key steps in preparing herself for her new venture, including reading books such as The Go-Giver by Bob Burg and She Means Business by Carrie Green, as well as working with a mindset coach. “I began to build up my network and meet lots of different people, as well as getting my website ready”, says Renu. The majority of her clients are female; entrepreneurs who are often working mothers needing direction and education around digital marketing, that fits around their busy schedules. At the core, the business is about adding value to clients and Renu achieves this through a combination of techniques. One to one sessions are at the heart of what Renu does, and she takes time beforehand to understand each clients individual needs, so she can get a proper idea of what they would like to achieve. Tapping into her skills working one on one, each session is fully bespoke and focuses on how to grow your social media platforms (facebook, instagram, blogs, LinkedIn), strategy planning, and content inspiration & vision, plus lots of professional tips and tricks along the way. And it’s not just businesses local to Leicestershire that can take advantage. Renu has helped people across the UK achieve their digital marketing goals, whether in person or via Zoom. Since the launch in June, Renu’s brand and community of clients has flourished, and she has fulfilled many of her goals for 2018. In July, she ran her first workshop and in August delivered her first public talk - exciting milestones for any entrepreneur. She also has set up communities on social media which are there to support the growth of businesses and other local female entrepreneurs.